At 01:15 am local time on 1 January 2017 a gunman shot and killed 39 people and wounded 79 others at the Reina nightclub in the Ortaköy neighbourhood of Istanbul, where hundreds had been celebrating the new year. Uzbekistan-born Abdulkadir Masharipov was arrested in Istanbul on 17 January 2017. Islamic State of Iraq and the Levant claimed credit for his actions. The first hearing in the trial of Masharipov and 51 accused accomplices was held on 11 December 2017, and the next hearing was held on 26 March 2018. From the 2016 northern summer, the Islamic State of Iraq and the Levant (ISIL) had been under pressure and had sustained significant territorial losses due to three parallel offensives: the Turkish-Free Syrian Army Western al-Bab offensive and Battle of al-Bab, the Syrian Democratic Forces' Northern Raqqa offensive, and the Battle of Mosul in Iraq. The Turkish military intervention in Syria was the first military confrontation between ISIL and the Turkish Army, raising tensions. 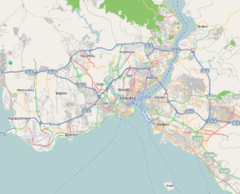 Before the nightclub attack, heightened security measures had been put in place in Istanbul, with 17,000 police officers on duty, following several attacks in the area, including the attack on the Istanbul Atatürk Airport on 28 June 2016 which killed 48 people, and a bombing at the Vodafone Arena on 10 December 2016 which killed 46. A gunman opened fire in the nightclub at about 01:15. He reportedly carried an AK-47 rifle and, after killing a police officer and a bystander at the entrance, he entered the club shooting, allegedly dressed up as the mythical character Santa Claus. The attacker reportedly spoke Arabic as the attack was taking place, and shouted the Arabic phrase "Allāhu akbar" during the attack. He reportedly fired more than 180 rounds during the seven-minute attack, and used stun grenades to aid in reloading. After the assault, he went into the kitchen, changed his clothes, and escaped by blending in with the crowd. At the time of the attack, about 600 people were at the nightclub to celebrate the New Year. Thirty-nine people were killed, including the police officer on duty at the club entrance, and at least 79 others were injured. A number of people jumped into the waters of the Bosphorus strait to escape the attack. In the aftermath, police set up a cordon around the nightclub. Istanbul's governor Vasip Şahin said the incident was a terrorist attack. The Turkish government ordered a temporary media blackout, citing concerns over security and public order. In response to the attack, the Turkish military carried out attacks against ISIL targets in the Syrian town of al-Bab. 22 people are claimed to have been killed in the raids. Seven Uyghur restaurant workers were arrested by police in Zeytinburnu, which became the site of over 50 police sweeps against "East Turkistanis" (Uyghurs), Kazakhs, Kyrgyz, and Uzbeks, a number of Uyghurs were detained outside of Istanbul in Selimpaşa, and altogether up to 36 people were detained in connection with the investigation in the days following the attack. It has been alleged that Kyrgyzstan passports were used by several families allegedly from East Turkestan with 20 children, and 22 women and men, all of whom were among 40 arrested by Turkish security forces in İzmir's Bornova and Buca districts. Weapons were found with the İzmir suspects. Syrians, Uyghurs, and Dagestanis were arrested in Izmir. On 9 January 2017, Turkish police identified the suspected gunman as an Uzbek national, Abdulkadir Masharipov (Uzbek Cyrillic: Абдул-Кадир Машарипов; born 2 August 1988), who also goes by the name Abu Muhammed Horasani. He was arrested on 16 January at a Kyrgyz friend's apartment in the Esenyurt district of Istanbul. Firearms, ammunition, two drones and about $200,000 were found in the apartment. Masharipov was 28 years old at the time of the attack and is believed to have been trained as a militant in Afghanistan and Pakistan before illegally entering Turkey through the Iranian border in January 2016. Masharipov is also believed to have trained with Al Qaeda in Iraq, the group that morphed into ISIL, and had spent most of his time in Turkey in the city of Konya before arriving in Istanbul on 16 December 2016. In an interview with police, Masharipov stated he was initially directed by ISIL to stage an attack at Taksim Square, but dropped the plan after conducting surveillance of the area and concluding there was too much security. Afterwards, Masharipov passed the Reina and decided it would be a good target to attack due to a lack of security. Among the victims were people from 14 countries, including Bollywood film producer Abis Rizvi, producer of the film Roar: Tigers of the Sundarbans. Vasip Şahin, the governor of Istanbul, described the attack as a "violent and cruel act of terror" and said that the attacker had used a "long-range weapon" to "brutally and savagely" fire on people, referring to a type of assault rifle. The President of Turkey Recep Tayyip Erdoğan condemned the attack and offered condolences on behalf of those who lost their lives, including victims from other countries. Many world leaders and officials condemned the attack, offering condolences. The US embassy denied social media rumours that it had prior intelligence of the attack. Some Turkish citizens, journalists, and pro-AKP journals such as Sabah put forward conspiracy theories, claiming that agencies from Western countries, such as the CIA, organized the attack. Doğu Türkistan Bülteni Haber Ajansı, which is the Turkish mouthpiece of the Uyghur group Turkistan Islamic Party complained about the Reina massacre suspect being named as Uyghur by Veysi Kaynak, the Deputy Prime Minister, blaming Fethullah Gülen and his movement for the attack. Doğu Türkistan Bülteni Haber Ajansı, speaking on behalf of the TIP, pledged its animosity against Russia and the PKK, saying it fought them alongside Turkmen in Syria for 6 years, denying involvement in the Reina nightclub massacre and trying to blame China for the massacre, claiming that Uyghurs in Küçükçekmece and Zeytinburnu were being unfairly targeted. Doğu Türkistan Bülteni Haber Ajansı and Zeytinburnu Uyghurs blamed the Gülen movement for the Reina nightclub massacre. ^ Şafak, Yeni. "Turkish court remands 44 in nightclub attack trial". Yeni Şafak. Retrieved 19 December 2017. ^ "Turkey detains 82 foreigners planning to go to Syria: report". Arab News. 10 November 2017. Retrieved 29 November 2017. ^ "Survivors remember horror in trial of Daesh massacre in Istanbul". Daily Sabah. 27 March 2018. Retrieved 4 April 2018. ^ Bilginsoy, Zeynep. "2 reported dead in New Year's attack on Istanbul nightclub". AP News. Retrieved 1 January 2017. ^ a b "Istanbul Reina nightclub attack 'leaves 39 dead'". BBC News. 1 January 2017. Retrieved 1 January 2017. ^ "35 killed in armed attack at Istanbul nightclub". Anadolu Agency. Archived from the original on 2 January 2017. Retrieved 31 December 2016. ^ "Son Dakika: Ünlü gece kulübüne silahlı saldırı". Hürriyet Daily News. Retrieved 31 December 2016. ^ "One attacker still inside Istanbul nightclub: CNN Turk". Reuters. Retrieved 1 January 2017. ^ "Gece Kulübü Reina'ya Terör Saldırısı Vali Şahin: 1 Polis Şehit, 35 Sivil Hayatını Kaybetti" [Terrorist Attack on Night Club Reina! 39 People Lose Their Life, 69 Injured] (in Turkish). sondakika.com. Retrieved 1 January 2017. ^ "Uusi vuosi alkoi verilöylyllä Turkissa – lue yhteenveto tuhoisasta yökerhoiskusta" [The new year began with a massacre in Turkey - read a summary of the devastating attack on a nightclub]. Helsingin Sanomat (in Finnish). 1 January 2017. Retrieved 1 January 2017. ^ a b "Police hunt lone Istanbul gunman who is on the run". News Corp Australia. 2 January 2017. Retrieved 2 January 2017. ^ Debets, Christoph (1 January 2017). "Anschlag in Istanbul: Killer schrie "Allahu Akbar"" [Attack in Instanbul: Killer shouts "Allahu Akbar"]. Euronews (in German). ^ "Istanbul nightclub attacker is ethnic Uighur, officials believe". The Guardian. Reuters. 5 January 2017. Retrieved 6 January 2017. ^ "Turkish authorities close to identifying Istanbul gunman". Fox News Channel. 2 January 2017. Retrieved 2 January 2017. ^ Arango, Tim (1 January 2017). "Terrorist Attack at Istanbul Nightclub Kills Dozens". The New York Times. ISSN 0362-4331. Retrieved 1 January 2017. ^ "İstanbul'da Reina gece kulübünde silahlı saldırı: 2 ölü, çok sayıda yaralı var" [Armed attack on Reina nightclub in Istanbul: 2 dead, many injured]. Cumhuriyet (in Turkish). Retrieved 1 January 2017. ^ Cunningham, Erin; Fahim, Kareem (1 January 2017). "Authorities search for a shooter after New Year's massacre at Istanbul nightclub". The Washington Post. Retrieved 1 January 2017. ^ "İstanbul'da gece kulübünde silahlı saldırı" [Armed attack on the nightclub in Istanbul]. Habertürk (in Turkish). Retrieved 31 December 2016. ^ Graham, Chris (31 December 2016). "Istanbul nightclub attack: Search continues for unidentified terrorist gunman who killed 39 at New Year's Eve party". The Telegraph. Retrieved 2 January 2017. ^ "At least 35 shot dead in Istanbul 'terror attack'". Euronews. 1 January 2017. Retrieved 1 January 2017. ^ Walker, Peter (2 January 2017). "Isis claim responsibility for Istanbul nightclub attack". The Independent. Retrieved 2 January 2017. ^ Stojanovic, Dusan; Fraser, Suzan (4 January 2017). "Istanbul on Alert as Hunt for Gunman Reaches 4th Day". ABC News. Retrieved 6 January 2017. ^ "Turkish nightclub attacker probably ethnic Uighur, says deputy PM". Reuters. 5 January 2017. ^ "Turkey car bomb and gun attack on courthouse in İzmir". BBC News. 5 January 2017. ^ "Reina operasyonu" [Reina operation] (in Turkish). Habertürk TV. 4 January 2017. ^ Masters, James; Lee, Ian; Hanna, Jason (4 January 2017). "Gunman identified in Istanbul nightclub attack, Turkish authorities say". CNN. ^ Stojanovic, Dusan (4 January 2017). "Turkey identifies gunman in Istanbul nightclub shooting". Associated Press. ISTANBUL. ^ "Turkish police identify Reina attacker as Abdulkadir Masharipov - CRIME". ^ "Reina Nightclub Attacker Identified As Abdulkadir Masharipov". National Turk. 9 January 2017. ^ Burke, Jason (5 January 2017). "Clues suggest Istanbul nightclub gunman may be a Uighur". The Guardian. Retrieved 17 January 2017. ^ Morton, Victor. "Suspect arrested in New Year's jihad attack on Istanbul nightclub". washingtontimes.com. Washington Times. Retrieved 16 January 2017. ^ a b c "Abdulkadir Masharipov: Who is Istanbul gun attack suspect?". BBC. bbc.com. Retrieved 18 January 2017. ^ a b "Istanbul Reina attacker 'switched target' after Raqqa order". hurriyetdailynews.com. Hurriyet. Retrieved 18 January 2017. ^ "Istanbul: Victims of Reina nightclub attack identified". Al Jazeera. Retrieved 10 January 2017. ^ "Istanbul nightclub attack: Bollywood grieves film producer and Rizvi Builders CEO Abis Rizvi's death". DNA India. Retrieved 1 January 2017. ^ a b "Seven Saudis among other Arabs killed in Turkey nightclub attack". Al Arabiya English. 1 January 2017. Retrieved 1 January 2017. ^ a b c "The Latest: Lebanese man says brother is among Istanbul dead". Seymour Tribune. 1 January 2017. Archived from the original on 2 January 2017. Retrieved 1 January 2017. ^ a b c d e f g "Victims of Istanbul terror attack identified". Anadolu Agency. Retrieved 2 January 2017. ^ "King Mohammed VI to Pay for Remains Transfer of Moroccan Nationals Killed in Istanbul's Attack". Morocco World News. 2 January 2017. Retrieved 2 January 2017. ^ "Two Indians among those killed in terror attack on Istanbul nightclub". Hindustan Times. 1 January 2017. ^ "Terror suspect who killed 39 New Year's revelers in Turkey on the run". NBC News. Retrieved 1 January 2017. ^ "Foreigners among victims of Istanbul attack". Daily Mail. 1 January 2017. Retrieved 1 January 2017. ^ "Israeli woman hurt in Istanbul club attack; another missing". The Times of Israel. Retrieved 1 January 2017. ^ "ישראלית נהרגה בפיגוע בטורקיה. "אמרנו לה לא לנסוע בגלל המצב"" [Israeli killed in Turkey terror attack. 'We told her not to go because of the situation'] (in Hebrew). Walla!News. 1 January 2016. ^ "גופתה של ליאן תגיע מחר לישראל במימון המדינה" [19 yr old Lian's body brought to Israel funded by the government] (in Hebrew). Israel Broadcasting Authority. Archived from the original on 3 January 2017. Retrieved 3 January 2017. ^ "Terrorism takes the lives of two Tunisians in Istanbul". Shems FM. Retrieved 1 January 2017. ^ "Turquie - Décès d'une ressortissante française - Déclaration de Jean-Marc Ayrault" [Turkey - Death of a French national - Statement by Jean-Marc Ayrault] (in French). French Ministry of Foreign Affairs. 1 January 2017. ^ "People from over 10 countries among Istanbul nightclub attack victims". RT International. Retrieved 2 January 2017. ^ "Attentat d'Istanbul : au moins trois Français blessés, le tireur toujours en fuite" [Attack of Istanbul: at least three French wounded, the shooter still on the run]. Le Figaro (in French). Retrieved 1 January 2017. ^ "Two from Germany killed in Turkish night club attack". TheLocal.de. 2 January 2017. Retrieved 2 January 2017. ^ "Two citizens of Azerbaijan injured in Istanbul terrorist attack". Vestnik Kavkaza. Retrieved 2 January 2017. ^ "Българка е сред пострадалите при атентата в Истанбул" [Bulgarian is among the victims of the bombing in Istanbul]. Dnes (in Bulgarian). Retrieved 1 January 2017. ^ "The Latest: Delaware businessman wounded in Turkey attack". Daily Mail. Retrieved 2 January 2017. ^ "Manhunt underway after 39 killed in Istanbul nightclub terrorist attack (GRAPHIC VIDEOS)". RT News. Retrieved 1 January 2017. ^ Smith, Hannah Lucinda (1 January 2017). "Hunt for gunman after nightclub massacre". The Sunday Times. (Subscription required (help)). ^ "Manhunt underway after 39 killed in Istanbul nightclub gun attack". Yeni Şafak English. Reuters. 1 January 2017. ^ a b Weise, Zia; Graham, Chris; Squires, Nick. "Istanbul nightclub attack: Search continues for unidentified terrorist gunman who killed 39 at New Year's Eve party". The Telegraph. Retrieved 2 January 2017. ^ "World leaders condemn attack at Istanbul nightclub (Video)". Stuff.co.nz. 1 January 2017. Retrieved 2 January 2017. ^ "US denies having intelligence on Istanbul club attack". Anadolu Agency. Retrieved 1 January 2017. ^ "Manhunt on for Istanbul nightclub shooter". Fox News Channel. Retrieved 1 January 2017. ^ Imbert, Louis. "A Istanbul, les théories du complot fleurissent" [In Istanbul, conspiracy theories flourish]. Le Monde (in French). ^ "Başbakan Yardımcısı Veysi Kaynak'a Cevap Uygurlardan Geldi; Kardeşimiz Dediğiniz DUK Fetö'cü, Bunu Biliyormusunuz". Doğu Türkistan Bülteni Haber Ajansı. Archived from the original on 19 January 2017. ^ "Komünist Çin, Türkiye'de Sansasyonel Eylem Yapmayı Planlıyor". Doğu Türkistan Bülteni Haber Ajansı. Archived from the original on 20 January 2017. ^ "ORTAKÖY KATLİAMINI FETÖ'CÜLER Mİ AYDINLATACAK ?". Doğu Türkistan Bülteni Haber Ajansı. Archived from the original on 2 February 2017.